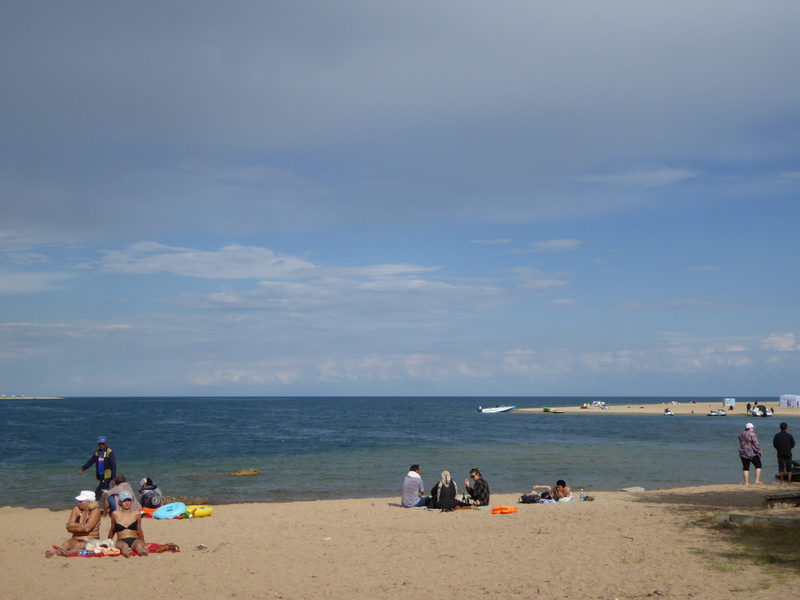 Issyk Kul is huge – some 170 kms in length and 70 kms in breadth, it feels more like a sea than a lake. Riding in marshrutka along the road bordering the north shore, it is impossible to see the south shore. 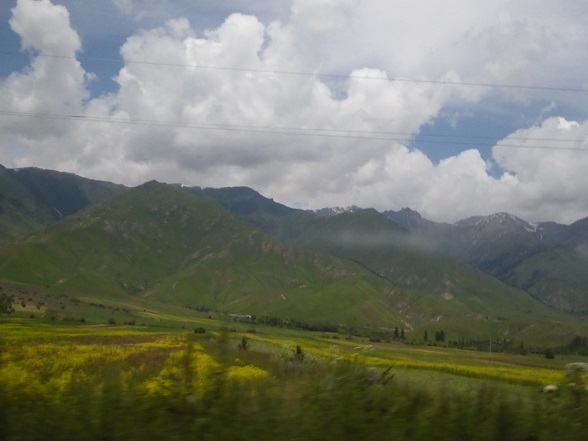 From Bishkek, the road headed east, with the lake to the right and in the distance, the AlaTau mountains to the left. The lower slopes of the mountains are a dappled green rising to stark black in the upper reaches. There is still plenty of snow along the tops, making them beautiful black-and-white picture perfect postcards. At the feet of the mountains are clusters of villages and between the villages and the road are fields. Some are brilliant yellow, mustard likely. Some are a lush deep green. Sometimes there are stretches of orchards. Some are apricots and some apples. It was not a long ride – three hours later I reached Cholpon Ata. All along we had been climbing steadily. That feeling of being happy that I get when I am in the mountains was growing. The heat and haze of Bishkek was left far behind and instead there was this cool clear air. The sight of looming snow-laden peaks, crisp air and a laid-back town. I took a look at my watch. Sure enough it read 1605 m. I was happy. Considered a tourist spot, this town caters largely to domestic tourists. There areRussians who live in Bishkek and Kyrgyz students who come here for a few days. Their primary goal is the lake and the tiny beaches that dot the coastline. There are thermal sources in the lake which means it does not freeze even in the fierce central asian winters. Even now when there is a nip in the wind, the water is lukewarm. But being wet and braving the cold wind is not for the likes of me. There are plenty of tourists though in their bikinis intent on getting a tan. I dipped the token toe and considered that enough. I have never been a beach person. 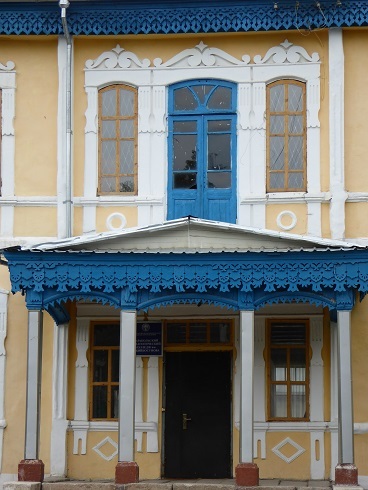 I stayed at a delightful family-owned guesthouse and tortured them with my slowly increasing Kyrgyz vocabulary. 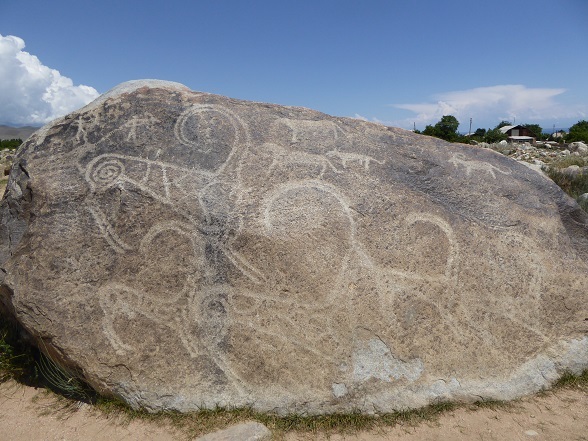 And visited the nearby field dotted with boulders bearing petroglyphs. History says that between 8th through 3rd centuries BC, there were several civilizations here. As the lake level fluctuated, many were submerged underwater. Called the Sakas, one of the earliest were reputedly of Scythian origin and they had established centers here. In later ages people of Turkic origin also had civilizations here. All traces of these civilizations now lie beneath the waters of the lake and only the Petroglyphs are visible in this field. 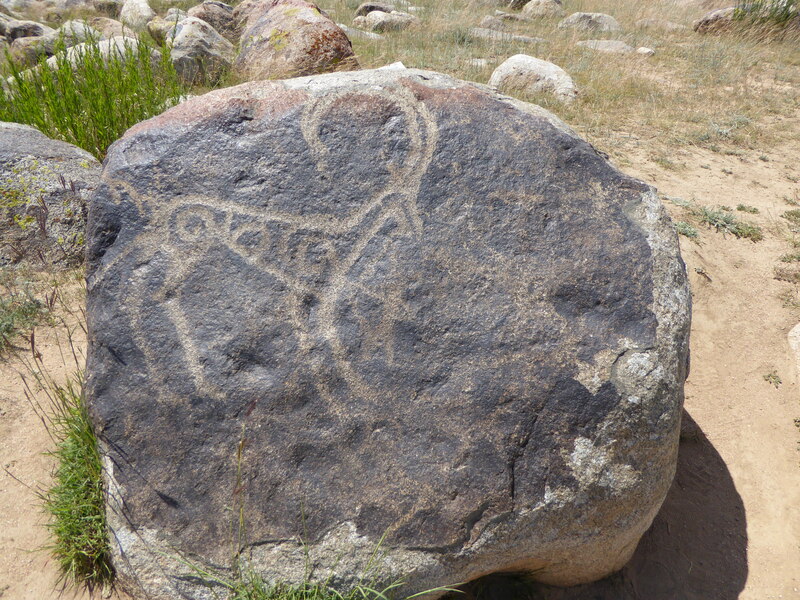 Some show ibex with long curved horns, some show hunting scenes. Some show stylized human figures. 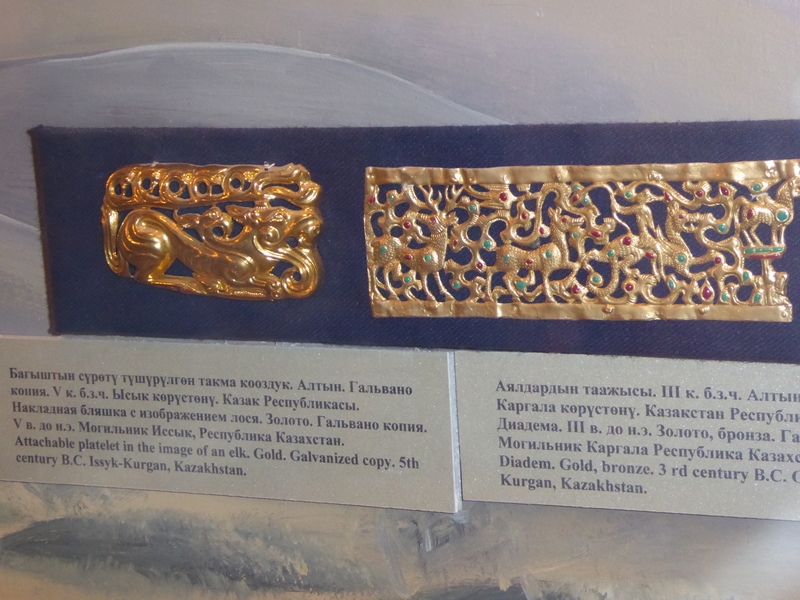 The local museum has well documented displays showing the underwater excavations and the finds include beautifully wrought gold jewelry. There are pots and pans and spearheads and utensils dating from th Bronze age. 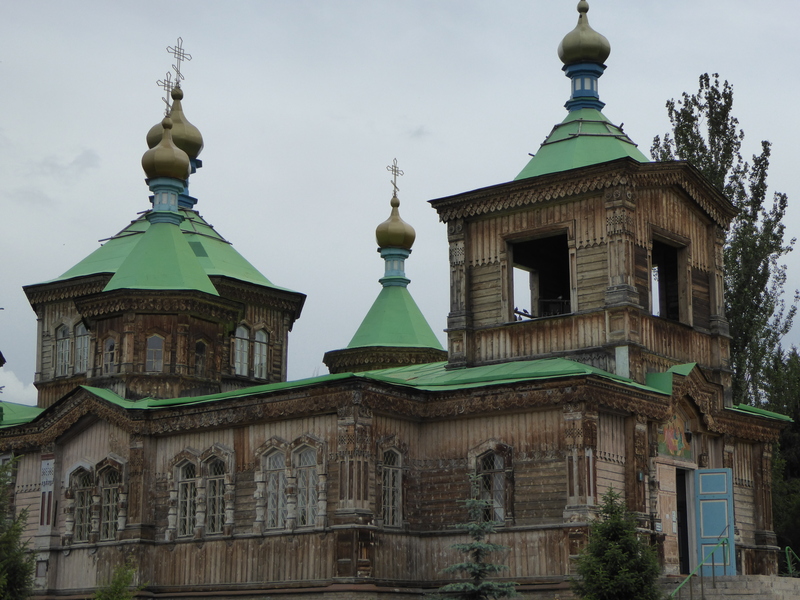 The next stop was the town of Karakol about 140 kms further east. Another marshrutka ride, this time only a couple of hours and I arrived in the largest town of this province. Dusty and fly-blown, Karakol hit me with a sense of deja vu. I was reminded of smaller towns in western and central Mongolia. The town, the roads, the people and even the sound of the language – it feels strangely Mongol to me, reminding me of Olgiy or Khovd or of Moron perhaps. Here too is the incongruous sight of women dressed to the nines with make-up and high heels strutting across dirt roads full of potholes and open ditches. The Terksey Ala Too range, a part of the Tian Shan mountains peek over rooftops from just about everywhere in town. They send out blatant invitations to go trek. There are treks aplenty but I may have to come back here for that. I left a bunch of stuff back in Bishkek am wearing a lightened pack. Being able to shoulder the pack feels grand! I’ve a feeling that I should leave well enough alone and not tempt fate. Wandering around town, I saw the Russian orthodox church. Renovated, this is a wooden structure, built in the style I remember from Siberia. There are a few older buildings as well that have the same gingerbread trim and curved window trims. They remind me of buildings I saw in Siberia. I suppose not that strange, given the Russian influence that this area had. The tiny bazaar is made of lines of stalls but there is a uniqueness to a Kyrgyz bazaar. The stalls are actually freight train carriages. The goods are displayed inside and some outside. Come five o’clock, the things are brought inside and the doors of the carriages are shut and locked. I suppose this makes them more burglar-proof than others. A couple of days was more than enough and I left for Bokonbaev, a town on the south shore of Issyk Kul. It started raining last night, heavily at times. Today dawned gray and bleak and the marshrutka ride was mostly in drizzling rain. The road hugged the coastline most of the time and it was difficult to distinguish between the gray of the water from the gray of the sky. Not as many fields this time, we drove past stretches of cliffs, the colors of red, orange and yellow. Mostly made of sandstone, wind and weather have eroded parts of these cliffs into fanciful shapes. A tourist destination called Jeti-Oghuz, or Seven Bulls is touted in local brochures. I did not feel intrigued enough to stop but what interests me more are the eagle hunting that people in this area still apparently practice. The town itself has a rough-at-the-edges feel to it with dusty streets, open drainage with fast-flowing water that locals dip buckets in and a general air of sleepyness. 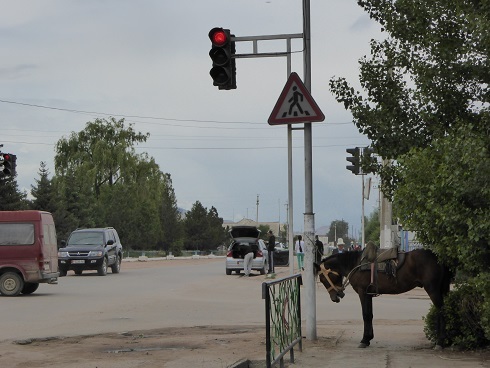 There are new cars of the latest makes but next to them is a horse tied to a lamp post. 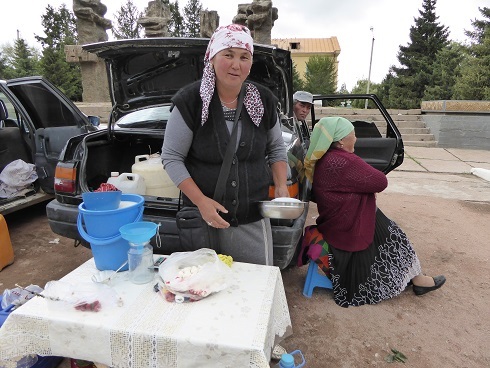 At one street corner there are people who come in from the countryside, selling kimiz, the fermented mares milk that so many slurp with relish. Wandering around town today, I asked about the eagle hunting. There is supposed to be a festival centered around using eagles for hunting but that is in late August. But I am told that it may be possible to see a demonstration. I am to go meet an eagle-man tomorrow and we will see. Another gray blustery day. But I made contact with the eagle man late last night via the Community Based Tourism office and all is set. There are some other tourists in a yurt camp about 12 kms from town and that is where the demonstration will take place. Ruslan, the eagle man arrived, driving a new Honda. 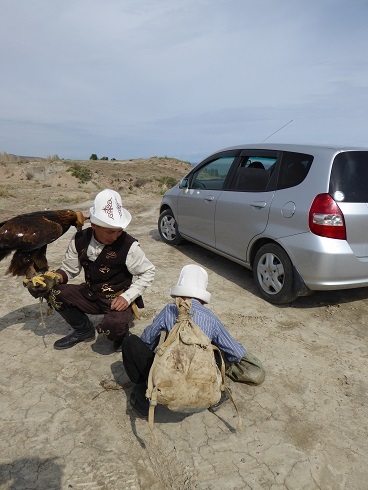 In the car was his young helper, Isa and two eagles – Karakus and Karachin. One was 2 years old and the other 7, both reared from either birth or from a very young age. They were both hooded but kept up a constant squawking as we drove at a snail’s pace over dirt roads to the bluff overlooking the yurt camp. 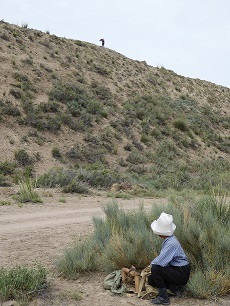 The car was left parked at the top the bluff and we slipped and slithered down the sandy slope to the camp. Isa carried a backpack containing a fox pelt and on asking if I could help, I was given gunny sack. It wriggled when I picked it up – the live rabbit, I was told. Once gathered together, Ruslan called out to Isa to begin. Isa had laid out the fox pelt on the ground and taken hold of the string attached to it. He started running for all he was worth down the dirt track. Shouting cry like ‘Eeeoouww’, Ruslan let the eagle go. We were all ready with our cameras but it happened so fast that it was over before we even realized! 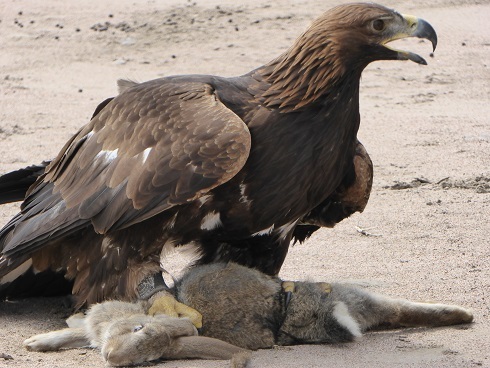 The eagle swooped down on the moving prey and had it pinned down under its sharp talons in under 10 seconds. 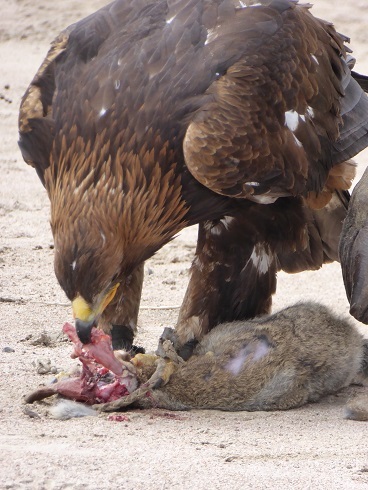 It took some coaxing for the eagle to let go of its prize and Ruslan rewarded it with a raw fish that vanished – skin, bones and all in a matter of minutes. The next demonstration involved the rabbit. As soon as it began to run,the eagle, this time the other one, swooped. In a blur of motion, it had the rabbit captured. No amount of coaxing would make the eagle let go of its prize. Nor did Ruslan try very hard. He says that those who use eagles for hunting, keep them until they are twenty years old and then release them into the wild. It is important for the birds to hunt and eat so they can survive the remainder of their usual lifetime of sixty or seventy years. And Karakus proceeded to tear off the fur and start eating the rabbit. Apparently they eat it all – fur, bones, entrails are all swallowed. The meat is digested and the bones and fur are regurgitated and spit out later. For a bird like Karakus, weighing seven kilograms, a meal of a rabbit is enough that she won’t need food for the next three days. Amazing to watch and even more amazing to learn that these eagles can even hunt wolves and bears if trained from infancy. Where the wildlife population in the rest of the world is dwindling, Kyrgyzstan still has a large population of wild wolves. 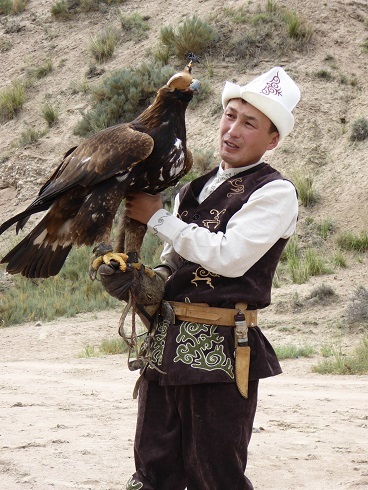 In fact they are enough of a menace to the herders that the government pays good money to eagle men to capture wolves. Wild ways that have disappeared elsewhere are still alive and well here. I just sent you an email. I’m in Osh now – hope to see you again in Bokonbayevo. Reply to the email asap please. Be well.